The College is fortunate in having no less than three Libraries within its buildings.The main Theological Library houses an extensive collection of volumes on a wide range of subjects. The collection is under review by the Library Committee, and an ongoing programme of “weeding” and re-stocking is being undertaken to ensure that significant new work is included while the valuable heritage of the past is not neglected. This section of the Library aims to allow Residents to have access to the standard works so that they can use their own shelves for books reflecting their own particular interests and specialisms.There is also a large collection of biographical studies. 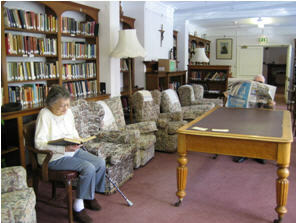 The Library is housed in a comfortable space where Residents can also sit and read from the range of daily newspapers and weekly journals which are to be found here. In addition to the usual material, the The Reference Library holds a range of theological dictionaries, encyclopedias and atlases, and a large selection of clerical reference works. 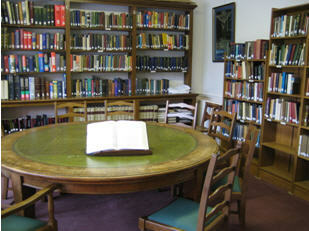 This smaller room offers a good place for quiet study, and houses the catalogue for the main collection. The Fiction Library lives in the same room as the Snooker Table! When browsing here you will find a wide range of classic fiction with a strong emphasis on detective stories and twentieth century fiction. There is also a collection of pre-recorded videos and DVDs which may be borrowed. To see further information and be able to browse through our extensive catalogue of books, please click here.